Published August 30, 2013 By Anna T. This post may contain affiliate links. Regardless, I only recommend sites I've researched and/or used and trust. So you want to start a blog. Or maybe you already did, but you don't know a thing about monetizing a blog. There are a lot of ad networks and affiliate programs that are huge and would fit for pretty much any subject you're blogging about, but there are also a lot of types of blogs that make money with unique earning avenues. I've listed several popular blog niches along with a list of ways to monetize that are unique to those specific niches. You'll find monetization ideas for work from home blogs, food blogs, coupon & deal blogs, fashion blogs, and much more. Consider everything listed a jumping off point/place to start. 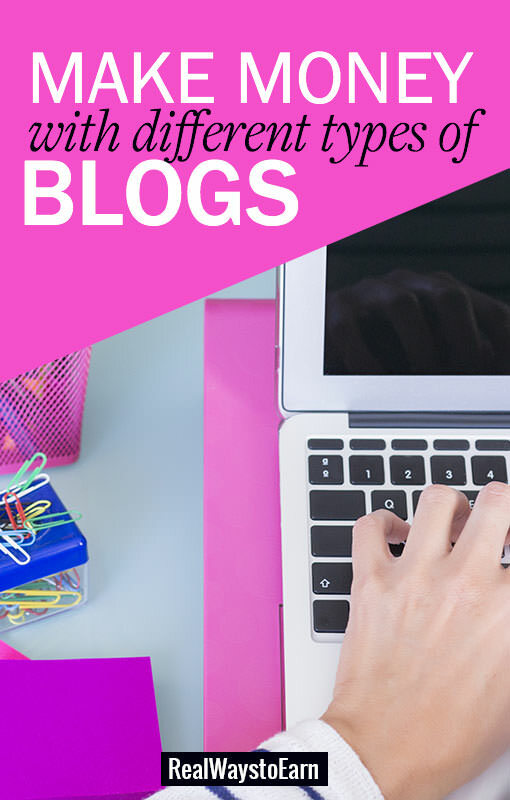 There are a lot of options so it may be overwhelming, but just take the time to experiment with what you find and see what works best for your blog! These companies will work great for just about any type of blog you can think of. Ultimate Bundles – Become an affiliate and promote their bundle sales to your audience. They have bundles throughout the year for just about every topic you can think of, including work from home, blogging, homemaking, essential oils, and so many more. You'll earn 40 percent commission on sales (70 percent if you're a contributor for one of the bundles). Share a Sale – Affiliate network. Different advertisers listed across multiple categories. Amazon Associates – Get paid for promoting Amazon products. This works with any blog niche because Amazon sells everything under the sun. AdThrive – I do use this network and love it! I think you have to have a minimum of 100,000 page views per month to get accepted. Mediavine – Another ad network similar to AdThrive (above). You can get in here with less than 100,000 page views per month. Note that there are many other “general” networks/affiliates. These are just the more popular ones. FlexJobs – This is a high-quality career search site that charges a fee for access ($14.95/month). They have an affiliate program if you would like to promote them. Jobs2Careers – A jobs site that makes it possible to earn by putting their search widgets, custom ads, and job listings on your site. ShopHer – This is another good one. In addition to lots of survey offers like Panthera (above), they also have tons of offers that are to do with coupons and saving money. A great choice if you have a money-saving blog! Write an e-book about work at home (something I did) and advertise it on your blog. You can put it up for sale using a service like Gumroad or SendOwl. And of course, you can sell it on Amazon. Provide work at home mentoring/coaching services for work from home and advertise them on your blog. Or, create your own work at home e-course on Udemy and promote that. Media.net – Another great choice for food blogs, as the ads will blend with the site. You can see on this food blog that I've helped someone set up as an example, the yellow blocks are actually ads, but they blend in nicely! FoodBlogger Pro – This is a very popular membership site for food bloggers. You can promote it to your audience (assuming you have some other food bloggers who read your blog) and earn commission when they sign up. Gourmet Ads – Another ad network for food bloggers. Write an e-Book – Many bloggers write and promote e-books on their websites, and recipe e-books tend to be super popular. I found a ton of great information on making money with a food blog here at Pinch of Yum. Very impressive with lots of detail! Dealspotr – This popular deal hunting sites lets bloggers sign up as influencers and earn all kinds of cash, gift cards, and bonuses for referring other users. ShopHer Media – Affiliate network with tons of coupons and money-saving offers. Coupons.com – The major affiliate networks listed above have Coupons.com affiliate links you can use for coupons, but you can also go directly through their site. SmartSource – Another big coupon network you can become an affiliate for. Look at the bottom of their homepage for the “Become an Affiliate” link, and then register. Amazon Associates – Amazon has some amazing deals from time to time. You definitely want to be signed up as an Amazon affiliate if you're going to run a savings/freebie blog. Groupon – Groupon has lots of great deals all the time, and they do have an affiliate program. Ibotta – This is a cash back grocery shopping app with a lucrative referral program. The three affiliate networks listed at the top also occasionally have Ibotta listed as an offer you can promote and get paid. Are you an expert couponer? Offer coupon classes and promote them on your blog. Again a platform like Udemy would be great for this. Write an e-book about couponing or frugal living and promote it on your blog. Craftsy – This is a very popular crafts site offering patterns, online classes, and more. They have a lucrative affiliate program. You can find the link to it at the bottom of their homepage. Do you create your own patterns? Digitize them and then sell them on your site. Write an e-book about crafts/DIY and promote it on your website. Sell your crafts on your website, or sell them on Etsy and link your Etsy store on your website. Offer online crafting classes and promote those on your website. If you become a product review and giveaway blogger, you can get in on a lot of sponsored opportunities through various brands. Sometimes your only compensation will be the free product to test out and review, but sometimes you'll also get paid. Here are popular networks to join if you're interested in starting a product review/giveaway blog. Linqia – Sign up to be a “storyteller” and get invited to exclusive, high-paying sponsored post opportunities. Clever – This one is not as easy to get accepted into, but I hear they have some pretty lucrative review opportunities. Reward Style – An invitation-only web tool that helps top tier style publishers find and monetize their content. Style Coalition – Offers influencers a simple, efficient way to get their names and blogs out to major decision makers from global agencies and brands. Subscription boxes are all the rage right now and there are a ton of beauty-related ones. Also, many of these have affiliate programs you can join and then earn money for promoting the boxes on your site. Some popular boxes with affiliate programs include Glossy Box, and Birchbox (through the Linkshare network). Yet again, if you're an expert on the subject, consider writing an e-book on beauty/fashion and sell it on Amazon. YouTube is great for beauty bloggers as well. Begin publishing some makeup tutorials and then upload them to YouTube. You can monetize your videos on YouTube and link them on your blog so your readers will subscribe. Note that as of April 2017, videos with less than 10,000 views cannot run ads. So it may take you a while to build up a big enough audience there to make money on the platform. Another way to figure out options to earn money with your blog is to closely examine other popular blogs in your niche. See what ad networks/affiliates they appear to be using and try to use the same ones. Can't get in with one of the networks above? Don't fret too much. Many of them are going to have specific monthly page view requirements and/or age requirements for blogs before they'll approve. Just keep up the regular posting and upkeep on your site and re-apply at a later date once you do meet the requirements. Not finding your niche above? In the future I might add a few other niches, but in the meantime you can easily find the info you need by doing a simple Google search for how to make money with blogs in your niche. My post on blog monetization also has multiple ideas for making money with your blog, and many of those are great ideas for any type of blog. Suzi at Start a Mom Blog has a really helpful list with many more smart blog ideas that make money. I hope this gives you some ideas. You'll notice that a lot of these options are interchangeable and as stated above, just experiment with different things and see what works best for your site. I always welcome your feedback, so please let me know what other options you would suggest for different types of blogs. Hi, Anna! I haven’t started my blog yet, and, when I do, I will definitely want to monetize it. I just wonder, how a blog that features mental illness, and auto-immune diseases would do? I used to be a nurse, and I have bipolar disorder, and fibromyalgia, so I’m on both sides of the fence–educator, and patient. Those are what I know about the most. What do you think? If these are topics you’re passionate about, I think it would do fine! If you write with passion, that always helps. There are other people, I’m sure, who would be interested in reading what you know. I would recommend visiting other websites on those topics, or similar topics, and seeing how they monetize. You can always use an ad network — those are across the board and will work for almost all blogs. And then I’m sure there are affiliate offers that could tie in with your topic. Possibly e-books too. For example, you can sign up as an affiliate on Amazon (Amazon Associates) and promote products and/or e-books with an affiliate link that are related to your blog topic. Then if someone purchases anything on Amazon through your link, you will earn a small commission. You could also sign up with some of the big affiliate networks like CJ and Share a Sale. They have affiliate offers for almost every topic under the sun. I have another post here on ways bloggers earn money – https://realwaystoearnmoneyonline.com/how-do-bloggers-make-money/ That may give you some ideas. Good luck to you! Thank you, Anna! I am passionate about spreading the word about mental illness-it’s gone on too much about the stigma it carries! People are branded because of it. Others can’t get work because of the people thinking about their being “crazy”–which is so unfair. Do you have any info on book blogging? Do you mean like a blog focusing on book reviews? I’ve just restarted my fashion/beauty blog! I’m going to look into many of these. Thanks so much! Thanks Anna! I joined skimlinks in early 2014 and also have a few cents earned with them. The sad thing is they are not replying to my emails since a month. I mainly contacted them for approving another of my blogs. The blog has nothing against the content policies, it’s just a product review blog. Even if it’s not approved I will get it, but the status for that blog is still showing as pending and I am getting no response from the skimlinks support. I am writing it here to reach out to them if they see this post. Thanks. No, you don’t have to pay them anything. Totally free for you! Thank you, this is by far the best article I’ve read that categorizes by blog niches. I teach basic blogging and Passion to Profit blog classes and this is exactly what I tell the students. I took Infolinks down for the same reason, Emma, although I did earn with it. I just thought all the underlined links were too distracting and would actually distract people away from the links I manually placed. I can vouch for Simply Hired, they do pay on time. I stopped using them because Indeed did better, but I know there are some people who say Simply Hired does great for them, so it would definitely be worth trying. Thank you for providing such detailed information! I’ve thought many times about monetizing my blog, but have been hesitant because I didn’t want it to start looking “cheesy” like so many websites do. But, I have to say that your blog looks amazing and very classy and I know you have it monetized. I hope you are doing well with it! Thanks for all you do and all the great info you research for your readers! Thanks, Karen! I appreciate the kind words. There definitely has to be a good balance … when you’re using ads, it’s really easy for it to look “cheesy” as you say if you’re not careful. The most important thing in my opinion is just make sure that no matter how many ads you use, your content is very visible so that when people land on your website, they don’t have to search through a bunch of ads to find the content they came there to read. It goes without saying that if they have to scroll down past a bunch of ads, they may not hang around long enough to find the content. Also, it can be tricky to find that balance. It does take a lot of experimentation!